Great for Familes and Golfers! Very private & Quiet Home with Beautiful Mountain Views. This 3,500 square foot home is fully equipped with comfortable furniture, Temperpedic (King), Pillowtop (Queen & Twin) mattresses, kitchen utensils, cutlery, pots, pans, linens, etc. This is the perfect place to get away and enjoy some quiet time relaxing or enjoy all that the North Scottsdale location has to offer such as Golf at Troon, Estancia, Desert Highlands and Legend Trail, Hiking Pinnacle Peak, boating on Lake Bartlett or visiting the Spa at the nearby Four Seasons or Boulders Resorts. You will enjoy relaxing in the pool and lounging at one of the outdoor patios. There is a seating area with gas fireplace, new (2015) piped-gas grill and new mini-refrigerator. A Loveseat & 2 chairs & additional cushioned seating complete this outdoor entertaining area. You can enjoy outdoor dining in the covered outdoor seating area with large Stone top table w/glider chairs. Everyone will have their own space in this home with an open floor plan & 14Ft Ceilings with 4 Bedrooms/3 Full Bath - 1 King, 2 Queen, 2 Twin + an Office. The kitchen has a large center Island and comes equipped with all cookware, utensils, pots & pans, cutlery, coffee maker, crockpot, etc. The Family Room is equipped with a 52' LCD TV w/DVD and Direct TV as well as a gas fireplace. 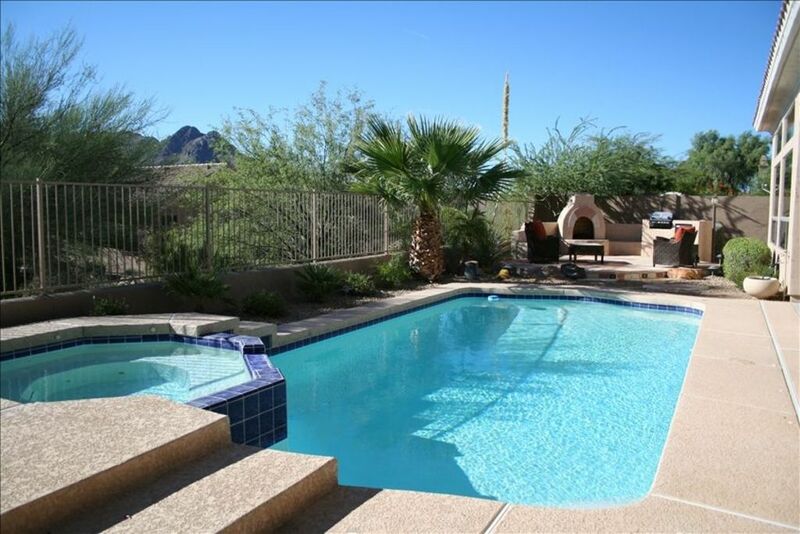 You'll enjoy great mountain views and gorgeous sunrises and sunsets here in quiet privacy while still being close to all of the activities you visit Arizona to do. We are Bob and Gia Craig and we live full time in Chicago, IL. Bob is a Realtor with EXP Realty and Gia has been an Corporate Account Manager at CDW Corporation for the past 22 years. We know the importance of a personal approach and pride ourselves on customer service and responsiveness to guest needs. We love visiting Arizona and decided we wanted to have a home in Scottsdale to be able to have an escape from the Chicago winters and to pursue outdoor activities that are limited in Chicago such as Golf and Hiking. We also wanted to be closer to my parents who live in Fountain Hills. We hope to one day retire in this home. We love the privacy of our home which backs up to a NAOS (protected open space). It is very quiet with no traffic sounds. The only things you will hear in our backyard are the birds and the occasional coyote howling. The great thing is that we are still only about 10 minutes from shopping and great restaurants or 20 minutes from major shopping and dining areas near the 101 and Scottsdale Rd. We are minutes from The Four Seasons if you want to have a day at the Spa or enjoy hiking Pinnacle Peak. If you travel 30 minutes NorthEast you can rent a pontoon boat or wave runners for a day on Lake Barlett. Wonderful property for a family vacation with two little ones. We spent most of our time on the beautiful backyard patio, in the pool or hot tub, having dinner outside, relaxing by the outdoor fireplace, or having coffee and watching the sun rise. The house has a stunning view over the desert—which we enjoyed at all times of day. Inside was equally wonderful. It was a beautiful home with all the amenities we could ask for, including a full-size crib and portacrib. Other bonuses were numerous nearby hiking spots, parks for the little ones, and plenty of restaurants and grocery stores. The house itself is in a quiet and beautifully landscaped neighborhood. We will definitely be back! By far the best rental house we’ve had. Superbly equipped (furnishings/kitchen equipment/linens/towels/wifi), comfortable (excellent bed/living room furniture), great location behind Troon Mountain. We can’t wait to come back! Lovely pool and outside space with fire pit and breathtaking views (although the poolside sun loungers are a bit wobbly and precarious). Gia was very responsive when needed (just about the pool heating) and made us feel very welcome. Glad that you enjoyed the house! Thank you for the feedback on the poolside loungers. We will get those replaced ASAP! Spotlessly clean with full amenities that were new and fully up-to-date. Had everything we wanted. Kitchen and bathrooms generously supplied with essentials. We felt very at home. Beautiful views. Quiet. We are so glad you enjoyed your trip and hope to have you back in the future! We rented this beautiful home for the month of February 2019. The kitchen, family room and dining room are a wonderful area for entertaining, which we did, as we have friends nearby. The pool, spa, patio and grill areas are great. The master bedroom and bath is wonderful. Gia and Bob were really very responsive and great to work with as we did have lots of questions. We did unplug the camera in the master looking at the pool & spa for privacy. The two surprises were a BIG Toyota Sequoia in the garage parked at a side angle taking up two car spaces. This made it very difficult to open our rear passenger doors when our car was in the garage. The other thing was no "block out" blinds on the master sliding glass door, therefore, the light came in early in the morning and at night you could see through the sheer drapes from the spa area into the master if the bedroom lights were on. Gia said they could remedy both of these items if we rented again, which we would like to do. Mary Ann, we are glad you enjoyed your stay! We appreciate the feedback on the drapes as they were newer and didn't realize. We will be getting those replaced! Awesome place for a guys week of Golf! Glad you enjoyed your trip Jeff! Nice house, great area, well equipped! Perfect for our Thanksgiving get together with our adult children. The house is very roomy and comfortable, and everyone had their private space. The kitchen, great room, and dining room easily accommodated our family. There was a high chair and toys that my daughter was able to use with our 8 month old grandson. The only disappointment was that we could not get the spa to heat up, but we would definitely consider renting this house again. We loved the location and beautiful views from the backyard. I am glad you enjoyed your family holiday Janis. Sorry again about the Spa! We hope to have you back again! Pool heating is not included. Pool heating is an additional $40 per night.